- Any subjects in line with the concept above or the subjects of the UNISEC Space Takumi Journal or other challenging subjects may be accepted to expand this academic realm. - The presentation method is oral and must be given in either English or Japanese. - Prospective presenters are encouraged to submit an abstract of 100-200 words to the UNISEC Office by June 14. 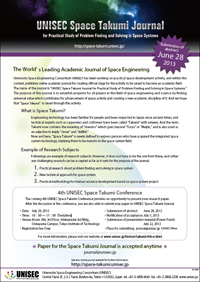 - Each abstract must be made on the basis of the abstract page on page 1 of the official template of the UNISEC Space Takumi Journal and sent its electric file to the UNISEC Office. - Presenters will be notified by July 28, 2013 if their abstracts have been accepted or declined. After the notification, a final presentation data must be sent to the UNISEC Office by July 22. There is no limit on the total number of pages. - The PDF file of the final presentation will be given to the conference participants and be published on the UNISEC Space Takumi Journal official website (http://space-takumi.unisec.jp/) in PDF format as archives. Development and Operation of an Education and Technology Demonstration Satellite "KKS-1"
Educational Result of Unique Active Learning for Project Management, "Rocket Girl and Boy Lecture 2012 in Wakayama"
- Lunch box is sold at the 3rd floor, Ishikawadai 1st Bldg. Also there are several lunch box shops available there.